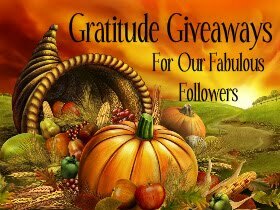 Google+ Reading Teen: Gratitude Giveaway! Happy Thanksgiving from The Reading Teen Team!! Thanks so much for an awesome contest. You guys are sweet. Thanks. What an incredible give away! I would love to win the Wake Fade Gone trilogy! Thanks for the chance to win. Wooow !! Thank you so much for this amazing giveaway!! Thank you so much for the awesome giveaway. Yes, of course I'm a follower, I love your blog! LOL! Thanks so much! Thank you so much for this giveaway.. Thanks for the aweosme giveaway! Thank you very much Alot of great books Great giveaway! Thank you for the chance to win fab books!! Thanks for the fantastic giveaway! New follower here from I Am A Reader, Not A Writer and All-Consuming Books blog hop. If you get a chance come stop by my blog for a visit! I'd love to have you! GREAT prizes! Thanks so much for participating! Oh Fantastic giveaway! Thanks for hosting! Hoping to win the wake series! Have a safe and awesome week!! Thanks for this amazing giveaway! I'm a new e-mail follower and I would love to win the Wake series! Thanks for the generous giveaway and for participating in this blog hop! I already follow via GFC (MamaHendo3).